Today, I’m announcing the winner for the La Serenissima crewel embroidery instructional guide from Talliaferro give-away from last week! One lucky winner will receive the instructional guide and pattern for this gorgeous design, thanks to Anna at Talliaferro. And, since I’ve had a lot of inquiries lately on how my personal adventure with cancer is going, I’ve also included a link to a little update at the end of the article, for those who want to read it. So many answers! I think we’re all on the same page with this one – the texture, the designs, the stitches, the fibers. What’s not to love about crewel work?! What I love most about crewel embroidery is knowing I am carrying on an historic tradition of women across the world who have created the same stitches I am doing now. The colors, patterns, textures and freedom of design are endless. La Serenissima is one such gorgeous example. Congratulations, Jeanne! Drop me a line with your mailing address, and I’ll get that out to you soon! For those of you who have kindly asked how I’m getting on lately with the Cancer Stuff, I’ve written a short letter to you let you know. For those who want to, you can read the letter here. Thank you for asking, and thank you all for your ongoing support, generosity, kind thoughts and prayers! They’re appreciated more than I can ever say! You’re the best! I’m still working on some tutorials and whatnot for Needle ‘n Thread. I’ve been dabbling with some bead embroidery and other little delightful things, but the going is a bit slow. Truth is, I’ve been spending more time on Late Harvest than anything else, because it’s set up and easy to access, it’s restful and not too taxing to work on. But in between, I’m eking out some other bits and bobs that I’ll be sharing with you soon! I’ll be reviewing a fantastic book – I call it a tome, as it’s pretty huge and pretty thorough – later this week, too. It’s a good one. February 18, 2016 La Serenissima Crewel Embroidery Give-Away! My very best wishes and hopes are with you! Congratulations Jeanne! I’m glad to hear you’re keeping up your spirits Mary. My dog has cancer and chemo didn’t have the effects on her that it does on people. I opted out of radiation for her because of the location where they removed her tumor. Alas, the beginning of last year they found inoperable tumors in her lymph nodes. They are not growing quickly but they are producing a lot of calcium so she gets treated monthly to reduce the calcium so it doesn’t shut down her vital organs. I really hate cancer but am grateful they can help treat it and sometimes eradicate it. I wish you the best on your journey through this. Mary, you are beautiful and an inspiration. And thank you for the update, Mary. You know we’re all out here–thousands of us–hoping and praying and doing what people who care do when we can’t do anything else. If we can’t be there with you, in person, to help out, we can certainly send our positive and hopeful energy to shield and buoy you. Thanks for the personal update. You are in my prayers. Thank you for the update, Mary, and it’s good to hear you sounding upbeat as you usually do except for those moments right before you “re-do” some of your embroideries. Audio books sound like such a good idea for long solo trips. Something fun that I like to do is to listen to re-runs of those old radio dramas from the 1940’s. and other things that you come up with. I’m curious about this book review you mentioned. Is it a newly published or an out-of-print? Keep healing, Mary, and keep us posted. Big congratulations to Jeanne Davis. This looks so much more beautiful than the fuzzy crewel kits I used to do years ago. She will end up with a project she can display with pride. And many thanks to you Mary for the update. I appreciate it so much. I sent an email sharing my brief thoughts and encouragement to you privately as well. Be not discouraged. . . .
What a gracious lady you are…taking cancer head on and handling it with such grace. You have my respect and my prayers for a return to health! Thank you for sharing your personal journey. I have no doubt you are encouraging others and I know you are setting a stellar example! Read your letter. I can not wait until you are all better to hear about your new projects and plans for your business. I can not speak for the others who visit your site but I look forward to your updates. Your spirit and strength are inspiring. Congrats, Jeanne. I hope Mary features your finished work for us all to see at some point. Thank you so very much for your update. I’ve been wondering, wondering. Time and patience, yes, and I must add Attitude, with a capital at that! Your Wonderful Attitude is encouraging to me and I trust it keeps your courage up too. …..and a special congratulations for you Jeanne. Yikes! That’s a lot of driving. I suppose it is a good sign that you can manage it-but I’m glad you have support in case you aren’t up to it at some point. I usually only lurk on this blog but I’ve been following it for the past year or so. I have it on the bookmarks bar of my browser window – that’s how often I refer to it. I think I’ve read every post! I just want to say thank you for teaching me how to embroider and so much about embroidery. Furthermore, I wish you all the best and sincerely hope your treatments go as well as they possibly could. Take lots of time to relax and rest! Don’t stress too much about blog stuff. You are such a brave and inspirational lady, I wish you strength for your fight against cancer. You are in my prayers. God bless you. Congratulations to Jeanne your stitching is beautiful. Thank you so much for the update. It’s very kind of you to take the time and trouble to keep your readers up to day. You have so much on your plate! Plse get well soonest dearest Mary. I have learnt so much from your site. Ever grateful. Congrats to Jeanne! You’re such a lucky girl! Mary, I continue to read your posts daily, although haven’t posted in a long while. I just lost a sister to cancer and can resonate a little with what you’re going through. Hers was a different type and not so survivable, especially since it was diagnosed late stage. I know I am not alone in that I consider you the best and foremost in Embroidery teachers and my main source for inspiration in that arena. I do so appreciate the fact that you are still posting and doing. I just wanted to let you know how I appreciate you and that you’re in my prayers. Women are like tea bags, you never know how strong they can be until you put them in hot water. (Nancy Reagan) I will keep you in prayers and wish good things for you. I wish we lived close. I’m about to retire and could be a driver if you needed! Lovely to hear you are doing so well Mary! Prayers for you to finish strong!!! Thank you for the update Mary. I will keep you in my thoughts and send healing energy your way. I have been though surgery, chemo, and radiation, too. I found that keeping myself busy creatively was powerful medicine. Happy you are doing the same and staying positive. Hang in there. Oh Mary, thank you so much for the update on your health. I don’t often have time to comment, but I am a devoted reader (even though I seem to have migrated from embroidery to cross stitch myself). I never miss a single installment of your blog. Since you began your cancer *Adventure,* I think about you literally every day. See, you are a part of our lives… You have my thoughts and prayers, always! Thanks for your update, it is good to hear you being so positive, you are an inspiration in so many ways. Well done Jeanne and, like other readers, feel it would be good to see the finished piece eventually?! As always, sending good wishes, Ann. I admit to being a bit of a lurker. I used to do crewel, especially as a child and young woman, now it seems other things take me from it. I love it and feel such happiness when seeing your generous tutorials. The photos and details are inspiring! I was unaware that you were experiencing cancer, and for that I am sad. Reading your update is, again, inspiring and joyfilled. I thank you for sharing it with us all. You (and all on your team) will be in my prayers. I believe in prayer. I have seen many “miracles”, God can do so much. May you always be in His care. Congratulations Jeanne Davis!! You are so lucky and I hope you share your piece when it’s complete. Mary, I am at a loss for words, I didn’t know. Keep your strong positive attitude and you will pull through. I will be sending positive vibes for you daily. I am happy for Jeanne Davis for winning, it just means I am going to have to buy the book and kit myself, which is okay. I just know that is the most beautiful piece of embroidery that I have ever seen. I just have to have it and complete it. Maybe it’s good I didn’t win as I would not have the patience to wait until I learned all the stitches and would want to delve right in! Thanks for the personal update. I was wondering how you were feeling. I love getting your newsletter and seeing your projects progress. All the best and be well! Mary, you are a marvel! Keeping positive in these circumstances takes real fortitude.All my very best wishes! Thank you for your personal update. you’re often in my thoughts and I am pulling for you. Like the other day when I gifted my gdaughter with the little box with your Tudor Rose embroidered on it. She loved it and asked if i’d done it on my embroidery machine. Told her no, that it was hand stitched and that’s how much I love her. Bald can be beautiful….remember that actress in the first Star Trek Movie, I can’t remember her name, but she shaved her head for the part and she was beautiful. But Mary, you’re beautiful to us whether you have hair or not and it does grow back after all the treatments doesn’t it? hang in there and keep on keepin’ on. Dear Mary, thank you very much for your update. You are doing all the right things – and keeping us informed and inspired about embroidery too – so be assured that needlenthread.com is a strong part of many people’s lives. If you hadn’t told us about La Serenissima how would we have known!! Well I’m off to buy it – kit, bag and caboodle – as my daughter’s fallen in love with it. She’s sitting a big exam tomorrow and although it will take a (little?) while for me to finish, I think you might know who is going to receive it when it’s finished. Thank you, once again, Mary. Very well put, Jeanne – Congratulations! I’m a counted thread person myself but I do love the look of crewel. Mary, thank you so much for sharing with us. You have made it through two gruelling stages and I know the hardest will be the last – the ‘we’ll see’ – so please let me add my voice to all those wishing you well along the way. Congratulations, Jeanne. Hope you enjoy your gift! Thank you for your personal update, Mary. May God bless you and give you strength through all this. It is very encouraging to hear how positive and hopeful you are as you share your journey with us. I’m glad to see you have such a positive attitude about your adventure with cancer. I know how difficult the journey is, but your straightforward approach to dealing with it will see you through. Best wishes to you. Best of luck to you!!! I’ve always enjoyed your sharing the vast knowledge you have. A friend of mine is going through the ‘diagnosis’ phase right now….she’ll know her treatment plan soon. All I can do is be there for her and I hope you know your followers are there for you as well! Wish we lived closer as I’d drive the 100 miles with you! Thanks so much for the update, Mary. Audiobooks are great for multitasking of all kinds. I usually am listening to one while I stitch. Good wishes headed your way! So glad you’re doing ok. Hugs. Hope Spring comes soon for all of us. I too love audiobooks when there is driving or riding to be done. I would like to recommend my favorite series, Janet Evanovich’s Stephanie Plum books. there are 23 of them now. They are laugh out loud funny. thank you Mary for keeping us updated on your health – that is very kind of you to take the time to do that. I was wondering how you were doing with your cancer treatment so the info was much appreciated and I, like so many others of your followers, am relieved that you are doing well. take care ! ps: any of those audio books worth mentioning ??? Prayers for you at the foot of the altar. Dear Mary, I have just read your letter and my admiration for you has increased 1000 fold. You are an inspiration for everyone, not just us stitchers who have learned sooo much from your beautiful work and lessons. Your passion for your beautiful stitches is amazing. I aspire to your skills and keep practicing everyday. I’m so glad to get an update on your journey with cancer. Thank you for being willing to share. Thoughts and prayers. Mary, thanks much for the update–I was eager to read it. So glad that you’re able to be positive and upbeat, although surely it must be as much struggle as adventure. Sending good wishes! I hope you succeed in this adventure with flying colors! And given the monumental strength and patience to get there. Bless you, Mary and thanks for the update. You are an inspiration for a positive outlook, I hope Spring keeps a spring in your step! As for the distance you have to travel….. incredible! Stay safe. Thank you for letting us know about your difficult adventure. I am constantly thinking of you and wishing you all the best. I really feel for you regarding the 100 miles – what a boring thing to do so regularly over such a long time. Please take care on the road, my friend! Congratulations to Jeanne I do hope you enjoy the lovely La Serenissima instructional guide what a lovely give-away and thanks Mary for the give-away. I’ve just read your personal letter update and I really wish you a full recovery, I will continue to pray for you as you go through this period in life. It’s great to hear of your positive attitude and you are an inspiration to us all who really care for you and hope for a full recovery. May God bless you and keep you safe. With much love. I’m so glad you’re doing relatively well, medically. I fell in love with audiobooks myself a while back and can’t get enough of them. Keep up the good fight. thank you Mary for the news about your health. You are a fantastic person and I would like so much to have a small bit of your courage and positiveness when having to face the issues you are dealing with. Thank you so much for being such an example to me and surely to others. You deserve the family you have and please do not hesitate to ask them for some help they will surely be so pleased to give you. I would live nearby, I would be so honored to help you as well. Thank you for the update, Mary. 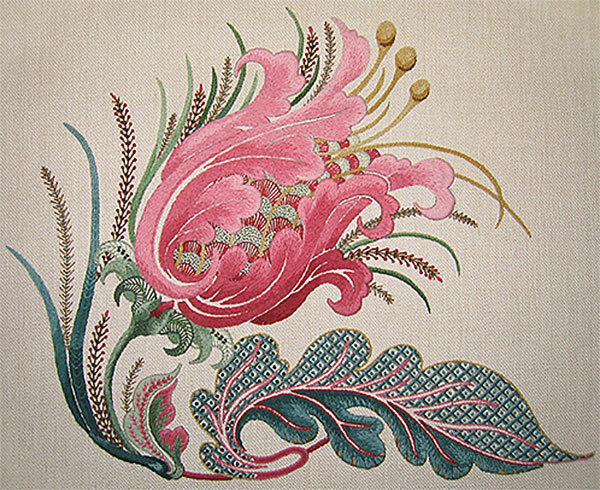 The knowledge you’ve shared has been so helpful to me over the years–like having a generous and friendly embroidery mentor. Whenever I get stuck on something or need inspiration, I check here first. Thank you for all you do. Sending you the very best wishes for your health. Congrats, Jeanne…how wonderful that you will have a new book to inspire your stitchery! Mary…thanks for the update on your adventure. You are in my thoughts and prayers. Congratulations, Jeanne! I loved your statement. The La Serenissima project is beautiful, and I hope it brings you much joy as you work on it. Salud y más salud para ti Mary!! Estoy segura que gracias a tu fortaleza pronto estarás sana completamente !! Apapachos (abrazos con el alma) desde México !! I’m thinking about you, Mary, and winging strong thoughts and positive vibes to you from here in the frozen north (no signs of spring in Ottawa at all!). Take care of yourself and don’t forget to ask for help. Your friends and family are longing to offer. Thank you for your update. It is so gracious of you to share such personal elements of your life, merely because we long to know how you are doing. It’s really none of our business, yet I am so pleased to hear that you are still well enough to be making that horrendous sounding journey, and that you are still so focuses on the positives. Oh Mary! Your personal letter is so inspiring…thank you for sharing yourself so freely with us. The hair will grow back, yeah…all of it – so glad you’ve taken the positive attitude and see the up side of things – LOL. If you’re interested in some creative solutions to head covering – google ‘wrapunzel’ for a bunch of videos and stuff on head wraps. Not sure if you’ll like any of, but there are some positive ladies on the site who know all about bald, cold heads! Now make sure you’re ready for that last week or so of radiation…it can be really tiring and it’s good you have some back up for the drive – yours is a long one! So glad you shared a progress report. Hang in there, Mary!! I will continue to keep you in my thoughts and prayers! Very best of luck to you with your medical treatments; hoping for the best possible outcome. Good Morning Mary. I’m visiting you with my cup of tea this morning. Your work is impeccably beautiful as always. I learn so much from you and your kind, generous spirit. I found your blog at a time in my life when I was home recuperating from surgery and you opened a door to needlework for me that continues. You took a newbie and created a love for learning needlework that appears to continue to grow over here. I admire your ability to communicate your very heart through your blog and classes. That is gift. Thank you for sharing your talent, knowledge, and time. I appreciate the update on your progress. Thanks, Kathy! I’m so glad you’re still enjoying Needle ‘n Thread! The Nesting Place seems like another life time ago – I hope you’re still using your needlebook! I was recently diagnosed with breast cancer, and when I went in to have my breast MRI, something “popped up” as they said, on my liver. I have another MRI scheduled tomorrow to “better identify the mass”. I have been scared, worried and anxious. I feel as if I have just learned to live with the fact that I have breast cancer, and now there is a possibility that there is more. After reading your letters about your New Adventure, I am feeling more confident and hopeful. When we put our minds to it, we can overcome anything. Thank you for your courage, and of course the wonderful and endless information on embroidery and needlework, I learned to embroider with your video lessons, and it has given me great comfort and satisfaction during my own Adventure. I wish you the best, and thanks again! Hi, Regina! I do wish you the best – especially better news after your MRI. Keep up your courage!